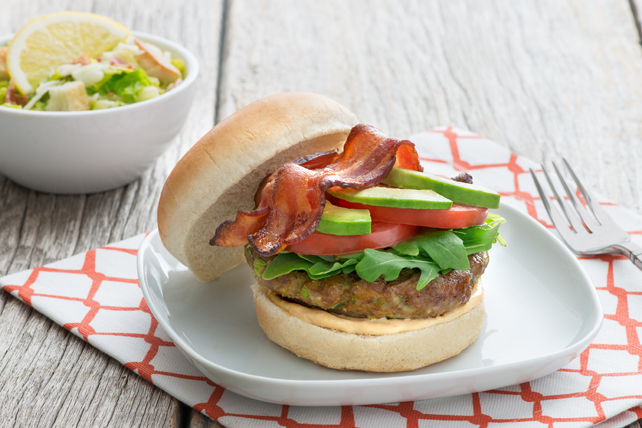 These already-delicious burgers get even better when served topped with arugula, tomatoes, avocados and bacon. Mix meat, bread crumbs, onions, egg, garlic, Worcestershire sauce, seasonings and 1 Tbsp. dressing just until blended; shape into 4 (1/2-inch-thick) patties. Grill 5 to 6 min. on each side or until done (160ºF), adding buns, cut sides down, to the barbecue to toast for the last few minutes. Spread remaining dressing onto bottom halves of buns; top with burgers, arugula, tomatoes, avocados and bacon. Cover with tops of buns. Top each cooked burger with 1 Tbsp. Cracker Barrel Shredded Double Cheddar or Tex Mex Cheese for the last minute of the grilling time.